AntiCorr is an anticorrosion coating which is applied to various metals in the atmospheric pressure plasma. (Fig. 1) The coating is part of a range of coatings that can be incorporated into the PlasmaPlus® system. The AntiCorr coating provides excellent corrosion protection for a wide variety of metals. This coating technology is particularly suitable for aluminum die-casting alloys. Alloys typically used in the automotive sector, such as AlSi12 (Fe), have withstood up to 960 hours in the salt-spray test chamber. This level of protection greatly reduces the common problem of subsurface migration. Different variants of the AntiCorr coating are suitable for bonding in downstream processes, or receiving solid seals. The PlasmaPlus® coating process has been integrated into automotive production lines for several years. Subsequently to the PlasmaPlus® process there is no temperaturestorage necessary. The following production process can be realized directly after the AntiCorr coating. Layers can be deposited on virtually any metal surface. 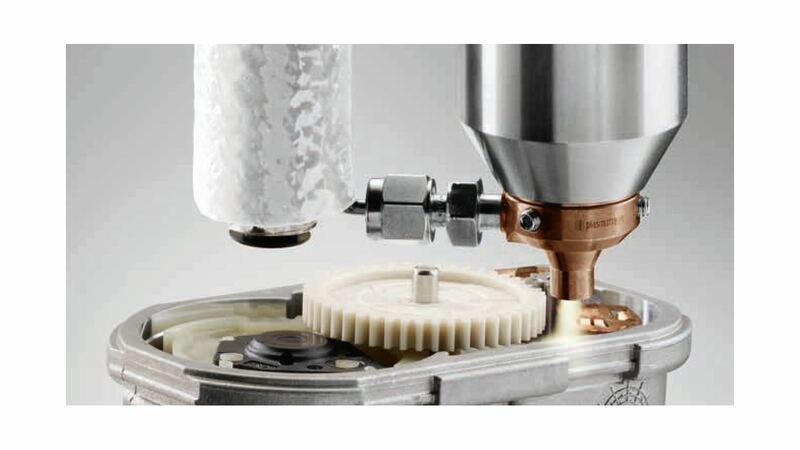 Defined surface roughness requirements are necessary only for enhanced test specifications. The AntiCorr coating process is so efficient that only very small quantities of coating material are required. Area-selective application enables target cycle times to be achieved in a very wide variety of different production lines. We will gladly develop a solution tailored to your specific requirements.